Definition at line 73 of file can.h. Definition at line 483 of file can.h. Definition at line 434 of file can.h. Definition at line 431 of file can.h. Definition at line 439 of file can.h. Definition at line 440 of file can.h. Definition at line 441 of file can.h. Definition at line 442 of file can.h. Definition at line 443 of file can.h. Definition at line 444 of file can.h. Definition at line 470 of file can.h. Definition at line 471 of file can.h. Definition at line 472 of file can.h. Definition at line 473 of file can.h. Definition at line 474 of file can.h. Definition at line 475 of file can.h. Definition at line 476 of file can.h. Definition at line 461 of file can.h. Definition at line 462 of file can.h. Definition at line 463 of file can.h. Definition at line 464 of file can.h. Definition at line 465 of file can.h. Definition at line 466 of file can.h. Definition at line 467 of file can.h. Definition at line 468 of file can.h. Definition at line 469 of file can.h. Definition at line 477 of file can.h. Definition at line 478 of file can.h. Definition at line 449 of file can.h. Definition at line 450 of file can.h. Definition at line 451 of file can.h. Definition at line 452 of file can.h. Definition at line 453 of file can.h. Definition at line 454 of file can.h. Definition at line 455 of file can.h. Definition at line 456 of file can.h. Definition at line 457 of file can.h. Definition at line 458 of file can.h. Definition at line 71 of file can.h. Definition at line 420 of file can.h. Definition at line 423 of file can.h. Definition at line 426 of file can.h. Definition at line 410 of file can.h. Definition at line 413 of file can.h. Definition at line 412 of file can.h. Definition at line 409 of file can.h. Definition at line 415 of file can.h. Definition at line 407 of file can.h. Definition at line 411 of file can.h. Definition at line 414 of file can.h. Definition at line 408 of file can.h. Definition at line 399 of file can.h. Definition at line 402 of file can.h. Definition at line 151 of file can.h. Definition at line 146 of file can.h. Definition at line 83 of file can.h. Definition at line 84 of file can.h. Definition at line 162 of file can.h. Definition at line 164 of file can.h. Definition at line 136 of file can.h. Definition at line 133 of file can.h. Definition at line 592 of file can.h. Definition at line 591 of file can.h. Definition at line 597 of file can.h. Definition at line 141 of file can.h. Definition at line 69 of file can.h. Referenced by can_disable_irq(), and can_enable_irq(). Definition at line 365 of file can.h. Definition at line 368 of file can.h. Definition at line 357 of file can.h. Definition at line 371 of file can.h. Definition at line 388 of file can.h. Definition at line 379 of file can.h. Definition at line 391 of file can.h. Definition at line 382 of file can.h. Definition at line 385 of file can.h. Definition at line 376 of file can.h. Definition at line 362 of file can.h. Definition at line 351 of file can.h. Definition at line 394 of file can.h. Definition at line 354 of file can.h. Definition at line 80 of file can.h. Definition at line 81 of file can.h. Definition at line 82 of file can.h. Definition at line 57 of file can.h. Definition at line 183 of file can.h. Definition at line 186 of file can.h. Definition at line 172 of file can.h. Definition at line 201 of file can.h. Definition at line 189 of file can.h. Definition at line 175 of file can.h. Definition at line 192 of file can.h. Definition at line 198 of file can.h. Definition at line 180 of file can.h. Definition at line 195 of file can.h. Definition at line 59 of file can.h. Definition at line 228 of file can.h. Definition at line 234 of file can.h. Definition at line 208 of file can.h. Definition at line 214 of file can.h. Definition at line 211 of file can.h. Definition at line 231 of file can.h. Definition at line 222 of file can.h. Definition at line 217 of file can.h. Definition at line 225 of file can.h. Definition at line 127 of file can.h. Definition at line 128 of file can.h. Definition at line 126 of file can.h. Definition at line 122 of file can.h. Definition at line 123 of file can.h. Definition at line 121 of file can.h. Definition at line 117 of file can.h. Definition at line 118 of file can.h. Definition at line 116 of file can.h. Definition at line 566 of file can.h. Definition at line 567 of file can.h. Definition at line 560 of file can.h. Definition at line 561 of file can.h. Definition at line 556 of file can.h. Definition at line 557 of file can.h. Definition at line 64 of file can.h. Definition at line 326 of file can.h. Definition at line 318 of file can.h. Definition at line 321 of file can.h. Definition at line 315 of file can.h. Definition at line 66 of file can.h. Definition at line 344 of file can.h. Definition at line 336 of file can.h. Definition at line 339 of file can.h. Definition at line 333 of file can.h. Definition at line 112 of file can.h. Definition at line 113 of file can.h. Definition at line 111 of file can.h. Definition at line 542 of file can.h. Definition at line 543 of file can.h. Definition at line 546 of file can.h. Definition at line 549 of file can.h. Definition at line 538 of file can.h. Definition at line 539 of file can.h. Definition at line 106 of file can.h. Definition at line 107 of file can.h. Definition at line 108 of file can.h. Definition at line 105 of file can.h. Definition at line 100 of file can.h. Definition at line 101 of file can.h. Definition at line 102 of file can.h. Definition at line 99 of file can.h. Definition at line 94 of file can.h. Definition at line 95 of file can.h. Definition at line 96 of file can.h. Definition at line 93 of file can.h. Definition at line 518 of file can.h. Definition at line 519 of file can.h. Definition at line 513 of file can.h. Definition at line 507 of file can.h. Definition at line 508 of file can.h. Definition at line 88 of file can.h. Definition at line 89 of file can.h. Definition at line 90 of file can.h. Definition at line 87 of file can.h. Definition at line 492 of file can.h. Definition at line 493 of file can.h. Definition at line 496 of file can.h. Definition at line 499 of file can.h. Definition at line 488 of file can.h. Definition at line 489 of file can.h. Definition at line 502 of file can.h. Definition at line 61 of file can.h. Referenced by can_available_mailbox(), and can_transmit(). Definition at line 294 of file can.h. Definition at line 277 of file can.h. Definition at line 260 of file can.h. Definition at line 302 of file can.h. Definition at line 285 of file can.h. Definition at line 268 of file can.h. Definition at line 257 of file can.h. Definition at line 245 of file can.h. Definition at line 242 of file can.h. Definition at line 239 of file can.h. Definition at line 308 of file can.h. Definition at line 291 of file can.h. Definition at line 274 of file can.h. Definition at line 299 of file can.h. Definition at line 282 of file can.h. Definition at line 265 of file can.h. Definition at line 254 of file can.h. Definition at line 251 of file can.h. Definition at line 248 of file can.h. Definition at line 305 of file can.h. Definition at line 288 of file can.h. Definition at line 271 of file can.h. Definition at line 547 of file can.c. References CAN_TSR, CAN_TSR_TME0, CAN_TSR_TME1, and CAN_TSR_TME2. [in] canport Unsigned int32. CAN block register base CAN register base address. [in] irq Unsigned int32. IRQ bit(s). Definition at line 337 of file can.c. Definition at line 326 of file can.c. [in] fifo Unsigned int8. FIFO id. Definition at line 446 of file can.c. References CAN_RF0R, CAN_RF1R, and CAN_RF1R_RFOM1. [in] nr Unsigned int32. ID number of the filter. [in] id1 Unsigned int16. First message ID to match. [in] id2 Unsigned int16. Second message ID to match. [in] id3 Unsigned int16. Third message ID to match. [in] id4 Unsigned int16. Fourth message ID to match. [in] fifo Unsigned int32. FIFO id. [in] enable bool. Enable filter? Definition at line 294 of file can.c. [in] id1 Unsigned int32. First message ID to match. [in] id2 Unsigned int32. Second message ID to match. Definition at line 313 of file can.c. [in] id1 Unsigned int16. First message ID to filter. [in] mask1 Unsigned int16. First message ID bit mask. [in] id2 Unsigned int16. Second message ID to filter. [in] mask2 Unsigned int16. Second message ID bit mask. Definition at line 259 of file can.c. [in] id Unsigned int32. Message ID to filter. [in] mask Unsigned int32. Message ID bit mask. Definition at line 277 of file can.c. Initialize incoming message filter and assign to FIFO. [in] fr1 Unsigned int32. First filter register content. [in] fr2 Unsigned int32. Second filter register content. Definition at line 199 of file can.c. References CAN1, CAN_FA1R, CAN_FFA1R, CAN_FiR1, CAN_FiR2, CAN_FM1R, CAN_FMR, CAN_FMR_FINIT, and CAN_FS1R. 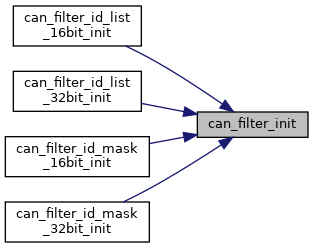 Referenced by can_filter_id_list_16bit_init(), can_filter_id_list_32bit_init(), can_filter_id_mask_16bit_init(), and can_filter_id_mask_32bit_init(). Initialize the selected CAN peripheral block. [in] canport Unsigend int32. CAN register base address CAN register base address. [in] ttcm bool. Time triggered communication mode. [in] abom bool. Automatic bus-off management. [in] awum bool. Automatic wakeup mode. [in] nart bool. No automatic retransmission. [in] rflm bool. Receive FIFO locked mode. [in] txfp bool. Transmit FIFO priority. [in] sjw Unsigned int32. Resynchronization time quanta jump width. [in] ts1 Unsigned int32. Time segment 1 time quanta width. [in] ts2 Unsigned int32. Time segment 2 time quanta width. [in] brp Unsigned int32. Baud rate prescaler. int 0 on success, 1 on initialization failure. Definition at line 92 of file can.c. References CAN_BTR, CAN_BTR_BRP_MASK, CAN_BTR_LBKM, CAN_BTR_SILM, CAN_MCR, CAN_MCR_ABOM, CAN_MCR_AWUM, CAN_MCR_INRQ, CAN_MCR_NART, CAN_MCR_RFLM, CAN_MCR_SLEEP, CAN_MCR_TTCM, CAN_MCR_TXFP, CAN_MSR, CAN_MSR_INAK, and CAN_MSR_INAK_TIMEOUT. [in] release bool. Release the FIFO automatically after coping data out. [out] id Unsigned int32 pointer. Message ID. [out] ext bool pointer. The message ID is extended? [out] rtr bool pointer. Request of transmission? [out] fmi Unsigned int8 pointer. ID of the matched filter. [out] length Unsigned int8 pointer. Length of message payload. [out] data Unsigned int8. Message payload data. [out] timestamp. Pointer to store the message timestamp. Only valid on time triggered CAN. Use NULL to ignore. Definition at line 470 of file can.c. References CAN_FIFO0, CAN_FIFO1, can_fifo_release(), CAN_RDHxR, CAN_RDLxR, CAN_RDTxR, CAN_RDTxR_DLC_MASK, CAN_RDTxR_FMI_MASK, CAN_RDTxR_FMI_SHIFT, CAN_RDTxR_TIME_MASK, CAN_RDTxR_TIME_SHIFT, CAN_RIxR, CAN_RIxR_EXID_MASK, CAN_RIxR_EXID_SHIFT, CAN_RIxR_IDE, CAN_RIxR_RTR, CAN_RIxR_STID_MASK, and CAN_RIxR_STID_SHIFT. The CAN peripheral and all its associated configuration registers are placed in the reset condition. The reset is effective via the RCC peripheral reset system. [in] canport Unsigned int32. CAN block register address base CAN register base address. Definition at line 63 of file can.c. References CAN1, rcc_periph_reset_pulse(), and RST_CAN1. [in] id Unsigned int32. Message ID. [in] ext bool. Extended message ID? [in] rtr bool. Request transmit? [in] length Unsigned int8. Message payload length. [in] data Unsigned int8. Message payload data. int 0, 1 or 2 on success and depending on which outgoing mailbox got selected. -1 if no mailbox was available and no transmission got queued. Definition at line 354 of file can.c. References CAN_MBOX0, CAN_MBOX1, CAN_MBOX2, CAN_TDHxR, CAN_TDLxR, CAN_TDTxR, CAN_TDTxR_DLC_MASK, CAN_TIxR, CAN_TIxR_EXID_SHIFT, CAN_TIxR_IDE, CAN_TIxR_RTR, CAN_TIxR_STID_SHIFT, CAN_TIxR_TXRQ, CAN_TSR, CAN_TSR_TME0, CAN_TSR_TME1, and CAN_TSR_TME2.